1. 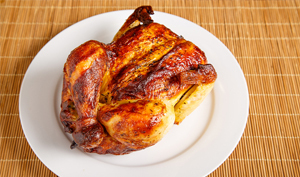 Preheat the oven to 375 degrees F. Rinse the chicken and pat dry with paper towels. Tuck the wings under the back and tie the legs together with kitchen twine. 2. In a small bowl combine the teriyaki sauce, orange juice, and orange marmalade. Heat the olive oil in a large Lodge cast iron skillet or Dutch oven over medium-high heat. Add the garlic and sauté for 2 minutes; add the onions and green beans, and cook, stirring, for 4 minutes. 3. Remove from the heat, move the vegetables to the sides of skillet, add the chicken, and rub thoroughly with the orange-teriyaki sauce. 4. Add the bay leaves and orange rind to the pan, place in the oven, and roast until the juices from under the chicken’s leg run clear, about 1 hour, basting every 15 minutes. After 1 hour, turn off the heat and let the chicken rest in the oven with the door cracked open for about 15 minutes. 5. Carve and serve with scallions and green beans.